I saw last week’s Daily Post Photo Challenge was “Shadow”. We don’t get much sun in the winter, so I decided to flip the challenge on it’s head. A shadow is the enemy of solar power, right? A couple of months ago I had bought a bunch of electronics for a solar powered project idea. I don’t know when I’ll get to the actual project or if my idea will even work, so I finally spent some time yesterday soldering and assembling the pieces. Everything worked great. I can use this little circuit to charge devices over USB (like an iPhone) until I make time to integrate into an actual project. 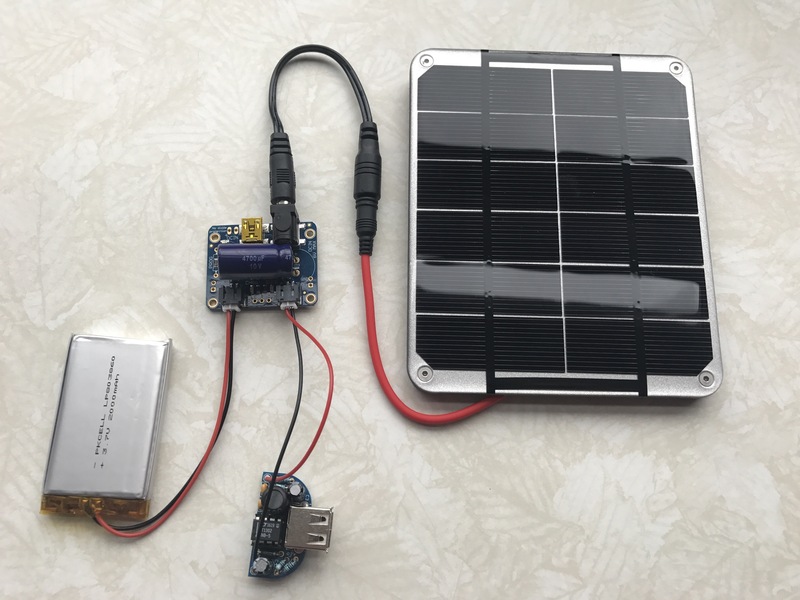 What you see here is a 6V 2W solar panel feeding into a USB/Solar Lithium Ion Polymer Battery charger. It’s charging a 3.7V 2,000mAh Lithium Ion battery. Also connected to the charger is a MintyBoost kit, which takes the 3.7V from the battery and boosts it up to 5V.